Perhaps more than at any time in their nation's history, Americans today are frustrated with the poor performance, increasing expense, and lack of improvement in their government-run public schools. The signs of that frustration are everywhere. Opinion polls reveal that education is a top voter concern during election seasons. Surveys show that large majorities of parentsregardless of their political beliefssupport more K-12 alternatives for their children. Thousands of families are on waiting lists to get their children into charter schools. Applicants for even partial private school scholarships number in the millions, and over a million more students are now being taught at home. Yet despite this widespread dissatisfaction, nearly 90 percent of American K-12 students still attend the same government schools that so many parents believe are substandard. The reason for this seeming contradiction lies in the fact that too many families are denied real choices in educationthe same kinds of choices they have in nearly every other area of life, from what kind of car they drive to the food they eat to the color and style of their clothing. What parents are demanding in ever-growing numbers is school choice. School choicethe right, freedom, and ability of parents to choose for their children the safest and best schoolsis not a new idea. Early Americans enjoyed complete freedom in education: There were no barriers, either political or financial, to prevent parents from choosing the schools they believed best met their children's needs. Until the mid-19th century, education was largely a private matter among families, who selected from a wide range of specialized schools. Universal government schooling as it is known today simply did not exist. Did leaving families free to make their own educational arrangements result in an uneducated populace? Far from it. The literacy rates of the mid-1800s were as high as 97 percent. Today, more than 20 percent of American adults are illiterate. Great Americans including George Washington, Thomas Jefferson, Patrick Henry, James Madison, John Quincy Adams, and Benjamin Franklin were schooled privately at home for most of their educational years. Of the 117 men who signed the Declaration of Independence, the Articles of Confederation, and the Constitution, only 1 out of 3 had as much as a few months of formal schooling, and only 1 out of 4 had even gone to college. Restoring a free market in education is a practical as well as a moral imperative. The repeated failure of government school reforms based solely on rules and resourcesstate testing and increased funding, for exampledemonstrates the need for incentive-based reforms such as school choice to improve the quality of education. Consumer choice is the engine for a market economy in all goods and services, and the competition engendered by choice results in superior products and lower costs. 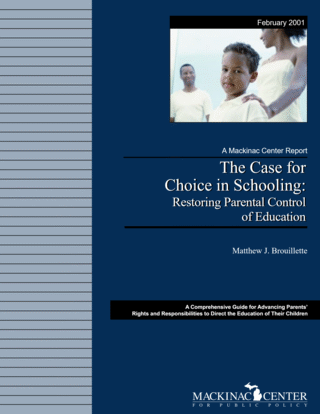 Parental choice in education will improve all schools, government and private, by providing them with powerful incentives to treat families as customers rather than as captive audiences. The resulting competition for students will help schools be more accountable to their customers, leading to lower costs and improved quality. Parents currently enjoy limited educational choice from among a range of K-12 government schools, and evidence suggests that even this small dose of competition within the government system has encouraged schools to innovate and improve. Full educational choice in the form of vouchers or tax credits to help parentsespecially lower- and middle-income onesoffset the cost of sending their children to private schools would result in increased competition and even more dramatic improvements. The benefits of school choice are clear. Parents have the right and responsibility to direct the education of their children. Removing the financial and political barriers that prevent families from choosing the safest and best schools will unleash the creative power of educators to act in a free society to improve education for all students. Stephen Reder, "The State of Literacy in America: Synthetic Estimates of Adult Literacy Proficiency at the Local State, and National levels," National Institute for Literacy. Available on the Internet at http://www.nifl.gov/reders/reder.htm. Christopher J. Klicka, The Right Choice: Home Schooling (Gresham, OR: Noble Publishing Associates, 1995), pp. 153-169. Blumenfeld, Is Public Education Necessary?, p. 21.